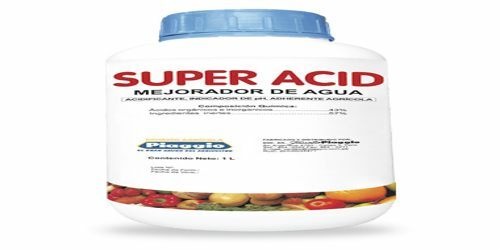 Superacid is an acid with an acidity greater than that of 100% pure sulfuric acid, which has a Hammett acidity function (H0) of −12. According to the modern definition, superacid is a medium in which the chemical potential of the proton is higher than in pure sulfuric acid. The world’s strongest superacid is fluoroantimonic acid, HSbF6. It is formed by mixing hydrogen fluoride (HF) and antimony pentafluoride (SbF5). Various mixtures produce the superacid, but mixing equal ratios of the two acids produces the strongest superacid known to man. According to the modern definition, superacid is a medium in which the chemical potential of the proton is higher than in pure sulfuric acid. Commercially available superacids include trifluoromethanesulfonic acid (CF3SO3H), also known as triflic acid, and fluorosulfuric acid (HSO3F), both of which are about a thousand times stronger (i.e. have more negative H0 values) than sulfuric acid. Fluorosulfuric Acid (FSO3H, H0 = -15.1). This is one of the strongest single-molecule acids, and is formed by the combination of HF and SO3. It is commercially available and distillable. Trifluoromethanesulfonic Acid (Also called “triflic acid”, CF3SO3H). 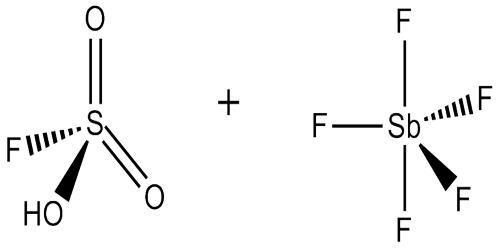 Triflic acid is extremely commonly used in research, especially when doing reactions with electrophilic intermediates (such as Friedel-Crafts reactions), because it does not have a tendency to sulfonate or fluorinate (unlike FSO3H). Metal triflate salts have also found wide application in organic synthesis as water-tolerant Lewis Acids. Anhydrous HF is also a superacid. This is due to the homoassociation of F- and HF to form bifluoride ions (HF2-), making the proton more “naked” and thereby increasing its activity. Chlorosulfuric acid is also a superacid, but is not that commonly used, due to its increased tendency to undergo oxidative side reactions. 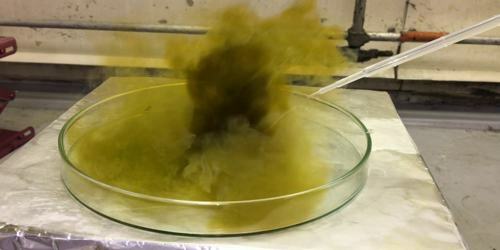 Magic acid is formed by mixing Antimony pentafluoride (SbF5) and FSO3 The name “Magic Acid” was coined by Joachim Lukas, a postdoc of Prof. George Olah at Case Western Reserve University, Cleveland, in the 60’s. Fluoroantimonic acid is considered the strongest liquid superacid, and depending on who we talk to, may be considered the strongest superacid. The term superacid was originally coined by James Bryant Conant in 1927 to describe acids that were stronger than conventional mineral acids. Rapidly and explosively decomposes upon contact with water. Because of this property, fluoroantimonic acid cannot be used in aqueous solution. It is only used in a solution of hydrofluoric acid. Evolves highly toxic vapors. As the temperature is increased, fluoroantimonic acid decomposes and generates hydrogen fluoride gas (hydrofluoric acid). Fluoroantimonic acid is 2×1019 (20 quintillion) times stronger than 100% sulfuric acid. Fluoroantimonic acid has a H0 (Hammett acidity function) value of -31.3. Dissolves glass and many other materials and protonates nearly all organic compounds. This acid is stores in PTFE (polytetrafluoroethylene) containers. The proton from superacids has been popularly said to become “naked”, accounting for the system’s extreme acidity. In the physical sense, the acidic “proton” is never completely free but is bound to the anion, albeit weakly. The proton hops from anion to anion in superacids via the Grotthuss mechanism, just as happens to acidic “protons” in water. The extreme acidity of the acids is due to the ease with which this proton is transferred to substances that cannot normally be “protonated”, due to the very high stability of the conjugate-base anion after it donates the proton. 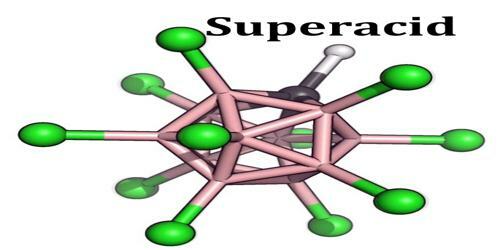 Superacids are use to create stable carbocations. Carbocations are used for the polymerization of plastics and the formation of high octane gasoline. Superacids are the only solvents for carbon nanotubes. In petrochemistry, superacidic media are used as catalysts, especially for alkylations. Typical catalysts are sulfated oxides of titanium and zirconium or specially treated alumina or zeolites. The solid acids are used for alkylating benzene with ethene and propene as well as difficult acylations, e.g. of chlorobenzene.